The 70's trend is still going strong and is continuing to be massive for Autumn Winter too. 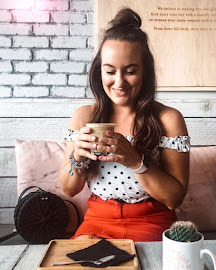 I've dabbled with the trend recently and am looking forward to transitioning it in the coming months so when Boohoo challenged me to create a 70's style outfit focusing on a suedette piece for a transitional feel, I was extremely excited! Mainly because Boohoo are massive and they wanted to work with little old me, I feel like I've made it as a blogger (jokes....but not really!) but also because I thought it was a challenge I could really get stuck into. Choosing a piece to style up proved rather difficult as Boohoo really do have some amazing items on their site, see here if you don't believe me! I ended up choosing this gorgeous lace up suede dress which I just love. It fits so perfectly and I love the lace up detail (even though it is abit low for me - braless is the way forward ladies!) The dress comes in 3 colours but I chose the navy as it's not a colour I have a lot of in my wardrobe and thought it would be a nice change from black (fave colour 4ever). As this was a challenge, I thought why shouldn't I challenge myself that little bit more and style it in a couple of ways so here is look 1 (make sure you head back on Friday to see how I style it again!) This layered look is more Autumnal and is perfect for this unpredictable weather that we are having at the moment. I lived in my gilet last year and I can see the same happening again this year. To bring the look together I went with all black accessories (cos there has to be some black in my outfits) with a standard HELLOTASHA fedora and these ah-mazing fringed boots, also from Boohoo. Seriously though how awesome are they?! They make me feel really sassy when I wear them, such a statement shoe! I hope you like this look! What do you think of this look? How would you style this suede dress? Let me know below! Make sure you head back on Friday for my second look!